SHORT BIO: Born in Pittsburgh, and still a diehard Steeler and Pirate and of course Penguin fan, Drew Levinson is a freelance Sound Technician/Sound Recordist based in Boulder, Colorado, (near Denver) with almost 35 years experience in the field. After graduating with a Communications Degree from the University of Massachusetts, Drew has worked regularly with clients such as NBC News, Frontline, CBS, ABC, NFL Films and numerous others. Drew is known to have a dry sense of humor, and enjoys a strong cup of coffee in the morning. 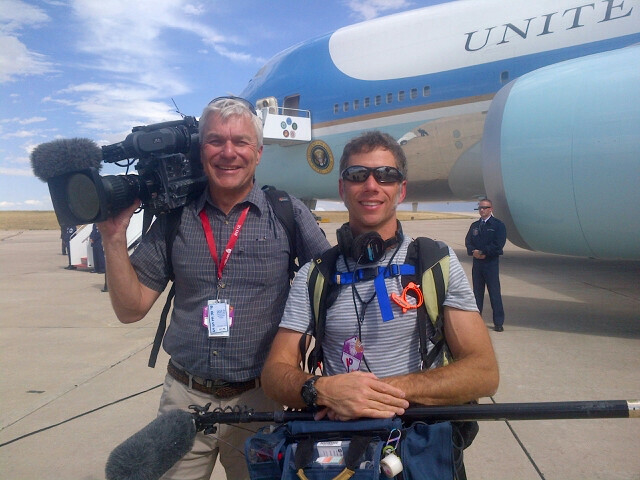 Over the years, his work has taken him across the globe to cover breaking news stories and television shows alike. He worked with NBC to cover the aftermath of 9/11, Hurricane Katrina, the Asian Tsunami, the Israeli Hezbollah War, the Haitian Earthquake, and the 2006, 2012, 2014 and 2016 Olympics. He has worked for several reality shows including Survivor, Extreme Makeover and The Big Give. In 2005, he was nominated for 2 Emmy's for both Survivor and Antiques Roadshow, and was on a team that won an Emmy for News Documentary: NBC Dateline, "Rescue in the Haitian Mountains" in 2009. as well as being on a team that won an Emmy for his work with NBC during the London Olympics. 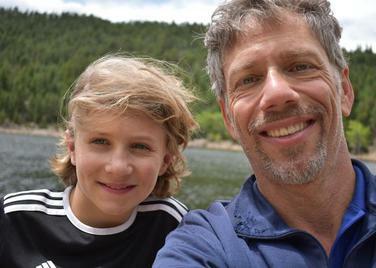 His lives in Boulder, Colorado and co parents his 9 year old son, Bennett....this little feller is a hoot!​ I hope you get to meet him! PHOTOS: On Dona Marta in Rio; ; with his son Bennett in New Zealand, Milford Sound Jan 2018, With Carl Filoreto; Boarding Air Force One during the 2012 campaign. (right).